I have three sisters. We argue, we fight and we love each other. When the four of us are together the laughter never stops and the tears of joy never end. There is nothing like a sister, a person who knows you better than you know yourself, and is always there when you need her. After Courtney was born I dreamed of another girl, a sister for Courtney, not three but just one. A sister just like mine, sweet and kind, nasty and mean, but in the end a sister. Someone to be a friend during adulthood and complain about parents, spouses, money and kids. To joke, laugh, cry, and fight, all the interaction sisters have, that was my wish for Courtney. 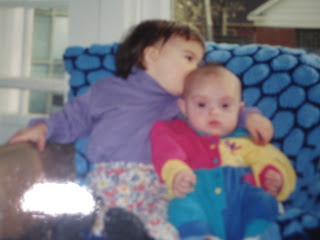 Alex was born 15 months after Courtney and although she was loved from the second she joined us, I grieved for Courtney. I imagined this sister would be a burden and a responsibility she did not ask for. I was wrong. In the beginning Courtney and Alex played just like any little girls. The fought over toys, stole food from each other and banded together to make a mess with play dough and paints. I believe Courtney sensed Alex was different, but it really did not become apparent to her until she started having play dates and noticing her friends’ siblings. We never made a big deal out of down syndrome, it was part of our vocabulary and we answered questions as they arose. It was a non event in her life. As Courtney got older I noticed she did not pay attention to Alex very much. I did not feel she was embarrassed by her sister, merely appreciated their differences and went her own way. I remember this was the way I acted as the oldest of five, but it still made me sad. In retrospect they were acting just like siblings. Alex misses Courtney when she is away. I know they do not talk too much, but Alex will text her occasionally, and squeal with delight when Courtney responds. They are not close on an intellectual level, nor will they ever be. This was my concern those 17 and a half years ago. I grieved the sister Courtney would never have, the emotional connection she would miss. Courtney is home for her spring break. Since we live in a resort town getting here during any break is very expensive. So we opted to fly Courtney to Denver a mere 3 ½ hour drive from our house. Alex and I made the drive, as I know Alex wanted to be one of the first people to see Courtney. That first hug between my two daughters made me realize how wrong I was – there is an emotional connection, a deep appreciation of who each of these remarkable young women are becoming, the sisters they have grown in to. As we got in the car and the girls fought over the front seat, I realized that although Courtney does not have a Susan, Mary Beth or Katie in her life, she has an Alex. I have learned that all sibling relationships are different, not matter the number of chromosomes. Granted Courtney will have responsibility for Alex well beyond other sibling relationships, but this is not something Courtney will resent, it is a part of who she is and her relationship with her sister. Alex has changed Courtney’s life for the better, as she has done to so many people she touches. Hi My name is Jenna, and I came across your site. My boyfriend and I are both self advocates in BC. Canada. We both have developmental delays. I am almost 30 but I have a mind of a 14 year old. My boyfriend is more high functioning than me, but he loves me because I am me. We are soon to be married in 2012 or maybe 2013. We want to get married in July of 2012 but my mom said it may take a bit to get the right supports in place for me, and I may lose funding off my micro board. I also have major health issues, and I was born with a life threatening disease. I am not supposed to make it to my 30th birthday which is March 23. My fiance, knows that but he still wants to support me, and love me for me. He is a great support in my life, the same with my parents. I still live at home in my parents place. I live in a basement suit. Alex is an amazing brave courageous person. I am a big fan of Justin Beiber. He is from Canada, and that is where I live. She is a very special teen and is beautiful inside and out. I love it when people sign my guestbook or email me.